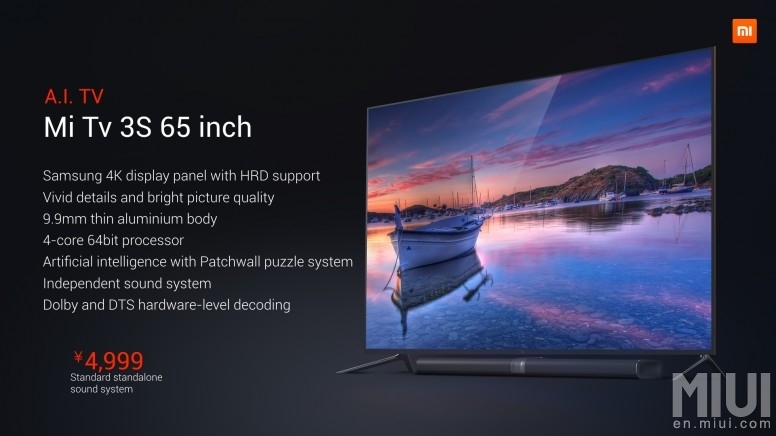 Xiaomi has just unveiled a new generation of smart televisions in China. 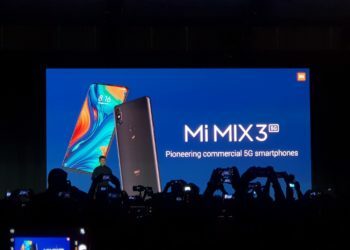 The Mi TV 3S is the successor of Mi TV 3 which was launched almost a year ago. The latest line-up consists of two models, one with a 55-inch screen size and another with a larger 65-inch display. 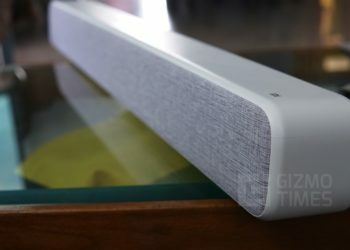 Xiaomi also unveiled a new home theater system along with the televisions. 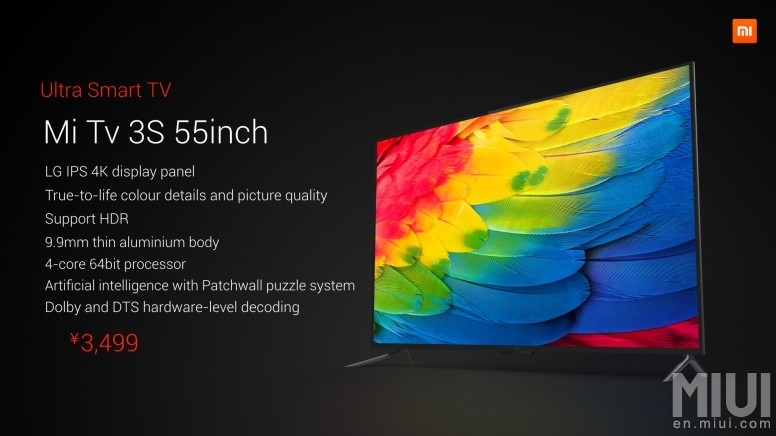 The smaller 55-inch version costs 3499 Yuan (Rs. 34,900 / $525 approx. ), and the larger 65-inch variant has a price tag of 4999 Yuan (Rs. 49,900 / $750 approx.). The latter will also be sold as a combo with the brand new Home Theatre at a price of 5999 Yuan (Rs. 59,840 / $899). The Mi TV 3S line-up are an extremely well build set of televisions. 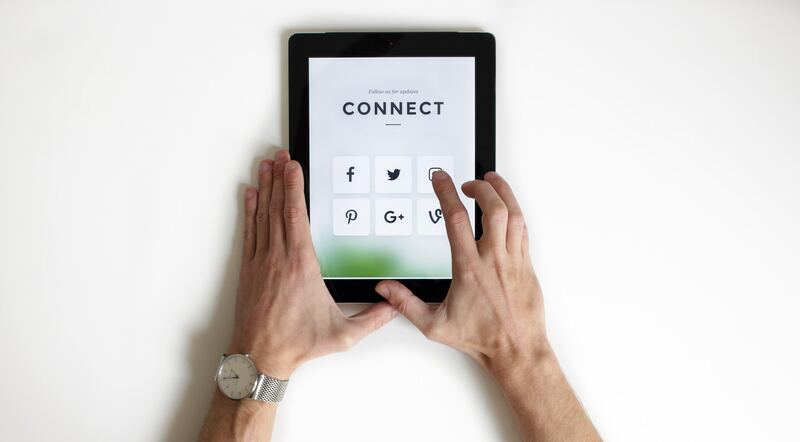 With the least thinness of 9.9 mm, they are one of the slimmest TVs around. Both the 55-inch and the 65-inch models come with a full metal chassis made of high-grade aluminum. The 4K televisions pack in some serious hardware and are the first TV series to feature artificial intelligence. The 55-inch variant features a 4K (3840 x 2160) IPS LCD panel manufactured by LG. It supports HDR (High Dynamic Range) and thus will be able to produce some exceptional picture quality. The 55-inch MI TV 3S is powered by a quad-core processor which helps it to run 4K contents seamlessly. There is hardware level DTS and Dolby audio decoding. On the other hand, the 65-inch model packs in a Samsung-made 4K (3840 x 2160) display. It is also an HDR-enabled screen and supports a wide color gamut of NTSC 85 percent. As mentioned above, the huge TV has a brushed aluminum finish and sports a minimum thickness of 9.9 mm and a maximum of 37.6 mm. This makes the 65-inch Mi TV 3S appear incredibly sleek and candy to the eyes. A 64-bit Amlogic T966 quad-core processor houses inside the television. It sports four Cortex A53 cores clocked at 1.8 GHz each. A four thread dual core Mali T830 GPU enables 4K (3840 x 2160) playback at full 60 frames per second. It also supports OpenGL 3.1 out of the box. Just like its smaller sibling, 65-inch version can also decode DTS and Dolby sounds in hardware level. Inside the Mi TV 3S, lies 2 GB of RAM combined with 8 GB of eMMC memory. The televisions even support dual-band 802.11ac Wi-Fi and Bluetooth v4.0. 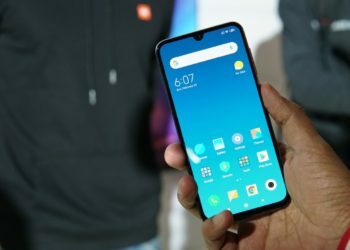 Xiaomi has loaded a 5th Generation Image Processing Engine for perfect rendering of HDR contents. Both the models sport an advanced artificial intelligence which goes by the name Patch Wall. 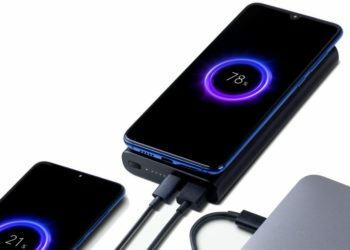 It’s Mi Brain supports deep learning, speech recognition, and computer vision. The ultramodern system will learn about your interests and shall be able to suggest you TV programs and movies based on your taste. 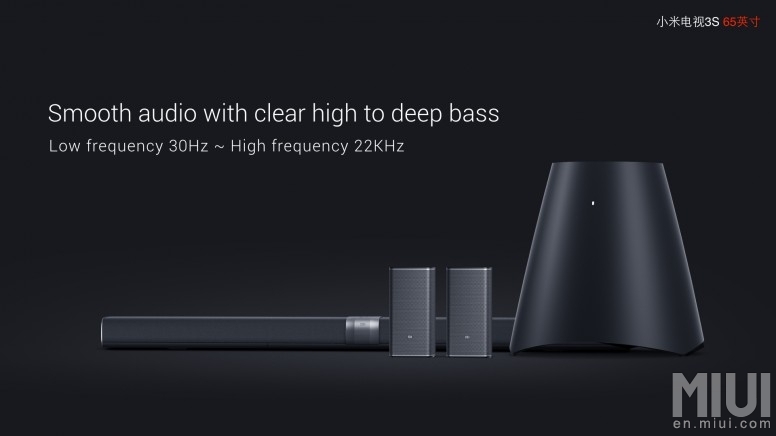 Xiaomi’s brand new Home Theater system is made especially for the Mi TV 3S. It can output frequencies from 30 MHz till 22 KHz. The Home Theater features a newly designed sub woofer, two 2.25-inch rear surround sound speakers, and an audio bar. He two rear speakers can work as a standalone stereo unit and supports dual band 5 GHz Wi-Fi. 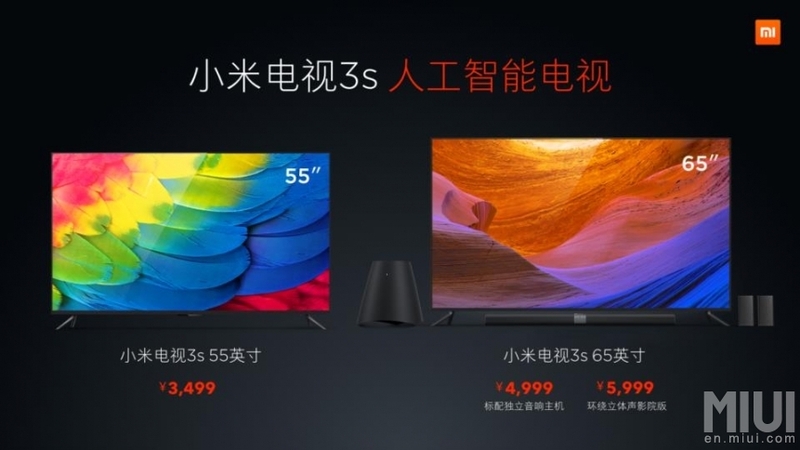 The Mi TV 3S and the Home Theater will soon be available for purchase in China.